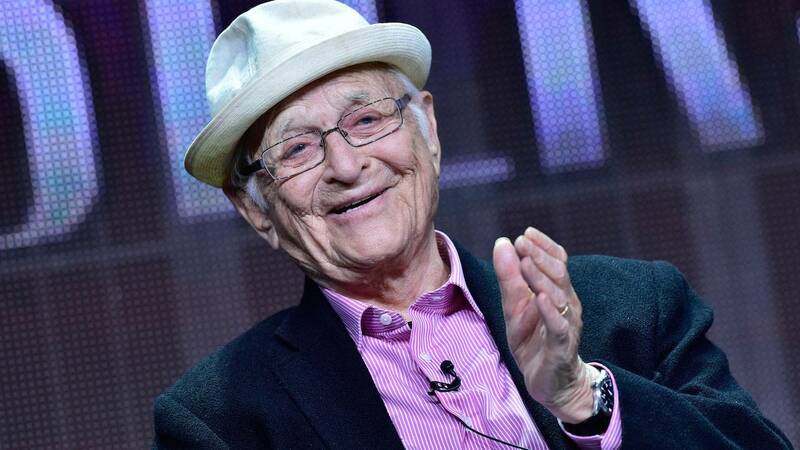 Sundance Film Festival -- January 29, 2016 — PBS and American Masters Pictures announced today that they have sold Theatrical rights to Norman Lear: Just Another Version of You, Directed by Heidi Ewing and Rachel Grady, to Music Box Films. The highly visual and dynamic film is the definitive chronicle of Lear’s storied career and premiered as the Opening Night selection at the Sundance Film Festival. Norman Lear: Just Another Version of You is the definitive chronicle of Mr. Lear’s life, work, and achievements, but it is so much more than an arm’s-length, past-tense biopic; at 93, Mr. Lear is as vital and engaged as he ever was. Top-notch cinéma vérité documentarians Rachel Grady and Heidi Ewing (Jesus Camp, 12th and Delaware, Detropia) seize the opportunity to fashion a dynamic portrait that matches the spirit of their subject. Breaking down the fourth wall to create an evocative collage where past and present intermingle, they reveal a psychologically rich man whose extraordinary contributions emerge from both his personal story and a dialogue with the world. Music Box Films, in conjunction with PBS and American Masters Pictures, will release the film theatrically in June prior to a Fall 2016 broadcast on PBS stations as part of the American Masters series, followed by the SVOD premiere on Netflix. PBS Distribution, the leading media distributor for the public television community, will handle DVD and Digital Distribution. Norman Lear stated, “At 93, I waited half my life to see myself in the cinema. And the smartest decision I ever made was to put my trust in directors, Heidi Ewing and Rachel Grady." Beth Hoppe, Chief Programming Executive, PBS, added, “This film represents the high-quality filmmaking that has been the hallmark of PBS, and we are happy to work with American Masters Pictures, Music Box Films, Netflix, and PBS Distribution to steward this terrific film through theatrical, broadcast on PBS stations, and on to VOD and home entertainment to help it reach the widest possible audience and raise the visibility of our first-class content." The deal was negotiated by David Koh, Josh Braun, Dan Braun and Ben Braun of Submarine on behalf of Michael Kantor, Executive Producer of American Masters Pictures, Stephen Segaller, Vice President of Programming at WNET, and Andrea Downing, Head of PBS Distribution; Ian Bricke, Director, Content Acquisitions, Netflix; along with Ed Arentz, Managing Director and William Schopf, President, Music Box Films, also negotiated. Norman Lear: Just Another Version of You is a Loki Films and American Masters Pictures production. Directed by Heidi Ewing and Rachel Grady (Loki Films). Produced by Suzanne Hillinger and Brent Miller. Executive Producer: Michael Kantor. Associate Producers: Alex Takats and Cara Mones. Camera: Ronan Killeen, Sam Levy, Jenna Rosher. Edited by J.D. Marlow, Enat Sidi. Music by Kris Bowers. Production Designer: Alex Basco Koch. Featuring appearances and interviews with Norman Lear, George Clooney, Bill Moyers, John Amos, Alan Horn, Russell Simmons, Amy Poehler, Jon Stewart, and many others. Submarine has been busy at this year’s Sundance Film Festival selling Weiner domestically to Sundance Selects/IFC Films and Showtime and Foreign Rights to Dogwoof; Lo and Behold: Reveries of the Connected World by Werner Herzog to Magnolia Pictures, The Lovers and the Despot to Magnolia Pictures, and Eat That Questions: Frank Zappa in His Own Words to Sony Pictures Classics. Submarine is a sales, distribution, and production company based in NYC. Submarine has been involved in the last 3 Academy award winning documentaries — Citizenfour, 20 Feet From Stardom, and Searching for Sugarman. Recent titles include Peggy Guggenheim: Art Addict, Miss Sharon Jones!, Mavis!, The Music of Strangers: YoYo Ma and the Silk Road Ensemble, Thru You Princess, Don’t Blink: Robert Frank, The Record Man: the Story of TK Records, Troublemakers: the Story of Land Art, Burden (Chris Burden doc), Finding Vivian Maier, The Wolfpack, Meru, Yayoi Kusama: a Life in Polka Dots, 3-1/2 Minutes, Best of Enemies, The Overnight, City of Gold, Batkid Begins, Tangerine, Being Evel, How to Change the World, Nas: Time is Illmatic, Dior and I, Blackfish, Keep on Keeping On, among others. Submarine recently launched a theatrical and dvd imprint, Submarine Deluxe; a low budget genre label, Torpedo Pictures; a German distribution imprint with NFP Films called NFP Submarine Doks; and Submarine 360, a museum distribution imprint, and a pan-Scandinavian imprint with NonStop Entertainment called NonStop Submarine. Submarine principals also represent comic book libraries Creepy and Eerie which are being developed across all platforms. Submarine recently announced the GP Submarine Fund at this year’s Sundance Film Festival. Founded in 2007, Music Box Films has quickly established itself as one of the leading distributors of foreign language, American independent, and documentary films in the US in theatres, on DVD/Blu-ray and via Video-on-Demand. Past releases include the film adaptations of Stieg Larsson's trilogy of international mega selling novels; the first in the series, THE GIRL WITH THE DRAGON TATTOO, with over $10 million in US box office, was one of the most popular international releases of the decade. 2012 heralded diverse new titles such as Terence Davies’ period romance THE DEEP BLUE SEA, starring Rachel Weisz, and Philippe Falardeau’s Academy Award-nominated MONSIEUR LAZHAR, one of the top grossing foreign language films of the year. Recent releases include Pawel Pawlikowski’s IDA, the 2015 Academy Award®-winner for Best Foreign Language Film, the acclaimed French TV series “Maison Close,” and the Golden Globe-nominated Israeli film GETT: THE TRIAL OF VIVIANE AMSALEM. Upcoming releases include Anne Fontaine’s romantic comedy GEMMA BOVERY, starring Gemma Arterton and Fabrice Luchini, and based on the graphic novel by Posy Simmonds (“Tamara Drewe”) Music Box Films is independently owned and operated by the Southport Music Box Corporation, which also owns and operates The Music Box Theatre, Chicago’s premiere venue for independent and foreign films.